Photo Credit: b24chicago via Compfight CC-BY-NC-SA. 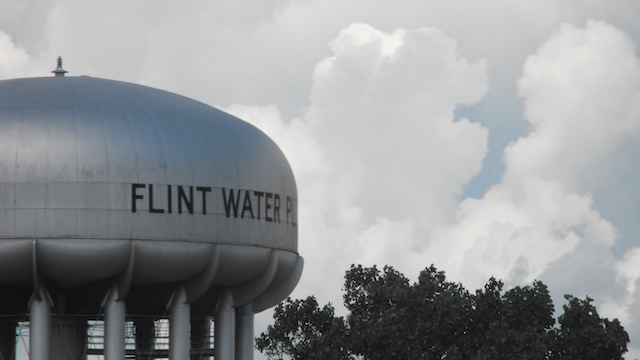 The environmental crisis brewing in Flint, Michigan, offers a powerful example of the problems that lie at the heart of our nation’s struggle for environmental, economic, and racial justice. Flint is the latest manifestation of a problem that some civil rights advocates have long described as “environmental racism”—a problem that gained new focus in the late ’80s and early ’90s, when a series of studies revealed that state and local governments routinely make decisions about pollution that disproportionately harm low-income communities of color [PDF]. Too often, state and local leaders hit the mute button when African American families raise questions or concerns about the health and safety of their own communities, or worse, as reportedly happened in Flint, leaders provide false assurances to communities about the risks they face. How can we ensure that when a community raises the alarm, their government listens and responds? In Flint, if government officials had listened, residents could have been spared exposure to dangerous toxins like lead. Lead poisoning has extremely deleterious effects on human health, particularly young people. Exposure to lead can cause developmental delays, learning difficulties, and hearing loss—issues that all manifest themselves in the classroom. A recent medical study found that the proportion of children living in Flint with elevated lead levels had doubled since the city changed its drinking water source, with the starkest disparities seen in children under 15 months old. One can only imagine the true impact the crisis will have on the current and future generations of young people in Flint. It’s likely one of the key reasons officials did not respond is the significantly diminished political power of African Americans in Flint over the last several years. A Michigan state law, Public Act 436, grants the governor power to appoint emergency managers to run cities, towns, and school districts deemed to be in financial distress. This power has been invoked frequently in Michigan and other states, primarily in areas that are home to large numbers of black voters. These appointed individuals effectively strip political power away from locally elected officials. Flint was not immune. In 2011, an emergency manager was installed and given vast political powers; a number of people held the job over the following four years, all eclipsing the authority of democratically elected local officials. One critical decision made during this time period, purportedly to save money, allowed Flint to cut ties with the costly Detroit water supply and opt for the Flint River as a temporary and cheaper water source while the city awaited the establishment of a new pipeline to the Karegnondi Water Authority. As state officials seek to shift blame for the current crisis, it is clear that an independent inquiry assessing the actions that took place over the last several years is necessary to restore public confidence in government and to ensure that those culpable are held accountable. There are also unanswered questions about whether the Environmental Protection Agency could have done more to manage the crisis. Pursuant to the Safe Drinking Water Act, the EPA has the ability to take action that will stop “imminent and substantial endangerment to human health.” Last fall, local residents of the Water You Fighting For coalition petitioned the EPA to intervene and take corrective action. That did not happen. To prevent crises like the one in Flint from occurring in the future, it is essential to promote democratic accountability and ensure that minority communities are not disenfranchised and stripped of their voices. Under our democratic system, officials who make dangerous and life-threatening environmental decisions should be held directly accountable to local citizens by way of the electoral process. When the political process fails, civil rights lawyers can be partners in safeguarding communities’ voices and protecting voting rights, mounting individual and systemic-level litigation to vindicate the rights of victims and achieve meaningful reform. The most effective advocates for clean and safe communities, however, are the impacted communities themselves. Minority communities must be equipped with the resources necessary to organize community-based coalitions and to raise awareness of areas of potential vulnerability. Only when their concerns are treated equally will justice—environmental, economic, racial, or otherwise—truly be served. Kristen Clarke wrote this article for Open Society Foundations. Ms. Clarke is the new president and executive director of the Lawyers’ Committee for Civil Rights Under Law.